Never before have so many experts on the life and times of Eliot Ness gathered at the same time, in the same place! Two of our featured speakers have just finished writing new books that shed new light on this fascinating man and orders for both of the titles are now being taken. Coudersport's own Paul W. Heimel was recently called "the dean of Eliot Ness researchers" by Vanity Fair magazine. 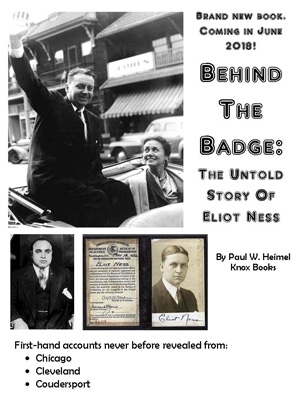 His new book, "Behind the Badge: The Untold Story of Eliot Ness," reveals long-hidden details and first-hand memories of the famous lawman from those who knew him best. Orders are being taken at knoxbooks.net. Meanwhile, A. Brad Schwartz has teamed with Max Allan Collins for a detailed examination of what really happened when Ness launched his attack on mobster Al Capone in gangland Chicago. 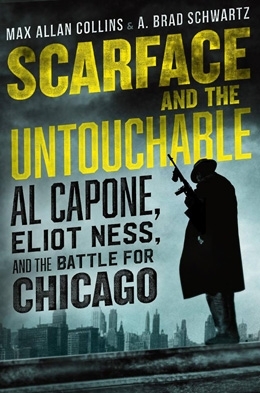 "Scarface and the Untouchable" is available at harpercollins.com.